What is the Neturei Karta? 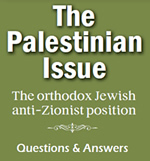 Over the years, a number of Neturei Karta activists and followers settled outside of Palestine. Some of the reasons that these individuals abandoned the country in which they and their families had lived for many generations (having lived there many years prior to the establishment of the illegitimate so-called "State of Israel") include; ideological refusal to live under the illegitimate heretical "Israeli" regime, their being exiled by the Zionist government for their insistence of remaining independent of the illegitimate heretical regime or them being unable to live a normal family life due to them and their families being persistently harassed, repeatedly incarcerated and many times even physically tortured by the Zionist police and agents. This dispersion resulted in the emergence of various Neturei Karta establishments on the broader international scene. These establishments include synagogues, educational institutions, publishing houses and organizations. The establishments in New York include three synagogues in Brooklyn (Boro Park and Williamsburg), three upstate, and organizations include the Friends of Jerusalem in NY, NY.